I’ve been thinking that I need to CHANGE my thinking. I will take every word captive…so to speak. Or actually – so to think. I need to ENCOURAGE myelf. I will do so with the word of God. So I came across this picture. We created it when mom was in the hospital fighting leukemia, we hung this poster on the wall and EVERY day wrote a new word-of-the-day. We thoughtfully, prayerfully decided on these words every day. We used these words to focus our minds. 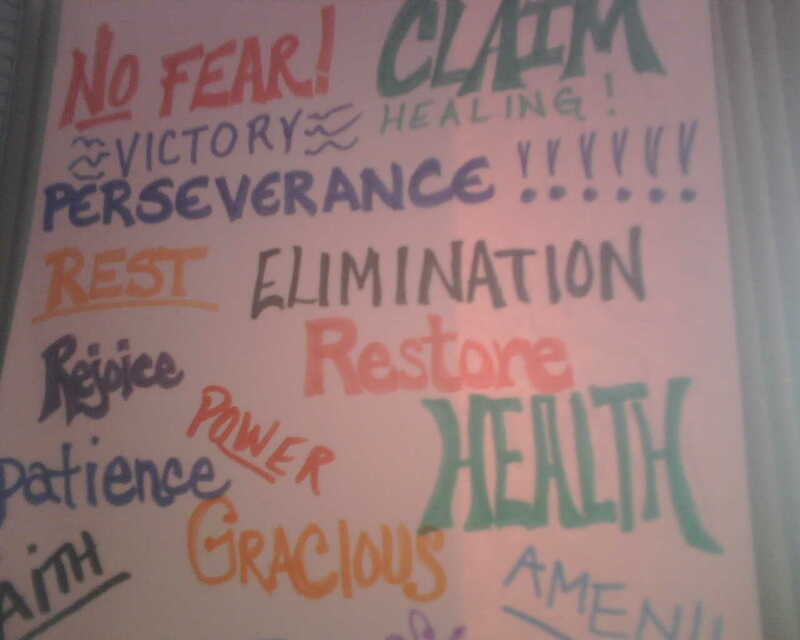 We wouldn’t focus on cancer, illness, symptoms, chemotherapy, death…we instead CHOSE to focus on these words. my mouth would encourage you; comfort from my lips would bring you relief. Today was a bad day, I cried most of the day. I finally ended up realizing that I was just feeling sorry for myself. Thank you God that YOU don’t have ‘pity parties’. I woke this morning to Bob telling me that he was sick, and sick of being sick. He then listed his symptoms. Long list. God? Will you fight in our stead? You did before. When I call you hear me. I trust you still. The battle is yours. We will stand on this battlefield and watch you move. If we yell, will the walls fall down? If we sing, will they tumble? Let me see you move God, let me hear you. 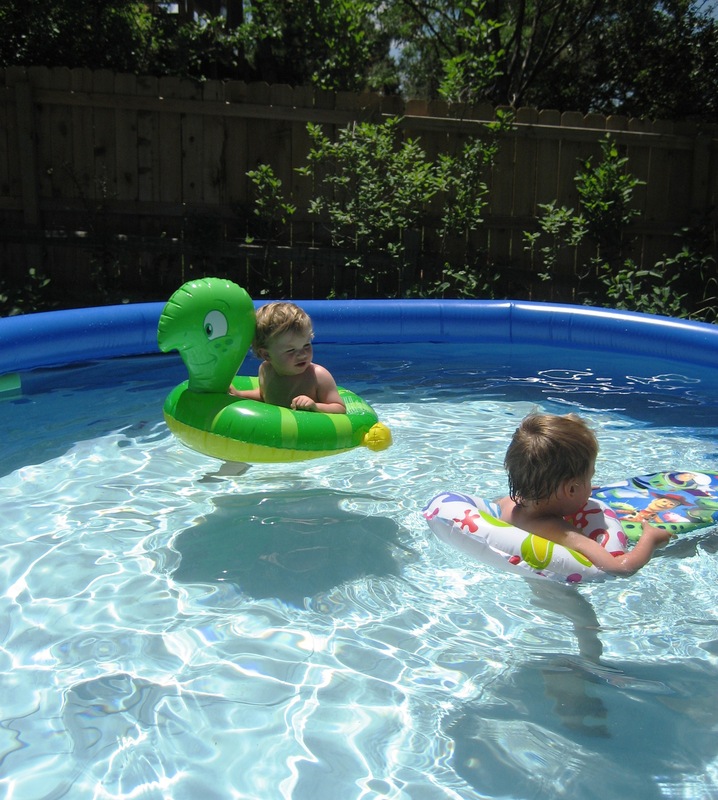 Summer of 2011 we bought an “easy pool” for the boys. This easy pool kept collapsing in the back yard. It became a FIGHT to keep it up; and I do mean FIGHT. The Bob I married would have fixed it. He would have made it right. The Bob I have now (fighting cancer again Bob) was too tired. He’d look out the window and say “Kim, that pool doesn’t look right” then go back to the couch for a nap. I was infuriated that cancer was taking Bob away from me again. Don’t get me wrong – my faith tells me that Bob is healed. Bob will not die, but live to declare the works of the Lord! But the journey continues to sap the energy out of him…and me. The pool collapsing over and over again was just a reminder to me that we were being beat up over and over again. I would watch him go for his nap and get so angry that I’d march out the back door, down the rickety splintered deck stairs (something else that my tired Bob hasn’t fixed) and drain that pool again to start over. “I will not let this pool beat me!” was my mantra. Bob helped when he could, my dad helped, Katie helped, both of my sons-in-law helped…but I felt like I was the only one committed to seeing this pool “not beat me”. (yes, I cried)…we did it! Persistence and perseverance paid off. Can I persistently believe for healing? Can our perseverance in this fight against cancer pay off? Yes, God’s word is true. We will not be beat. I’m trying to ‘find my strength’ again. Need to stop letting the enemy push me around. Just need to stop retreating, and feeling sorry for myself. So…back to what I KNOW. God is the CREATOR. He created me, he created Bob, he created the earth, the stars the oceans the mountains the flowers. Satan creates nothing. Satan re-uses. He recycles the same old thing. He recycles my hurts, pain, problems … against me. He is not creative. He is boring. So much so, that this time, this battle with cancer is so eerily the same it’s almost ridiculous. For example: The life insurance agent from 7 years ago called!! I actually laughed out loud. You gotta be kidding me…the enemy is trying to re-use something exactly the same as before. Wow. And the feeling that I have of not being loved, being alone, being abandoned by my husband. Same. And the work stuff being overwhelming….really overwhelming…same. The monsters at work are different. But really it’s all the same. Nothing has changed. Satan didn’t have anything new, so he used cancer again. And he even used it the same way as last time. The basement flooded…A/C condenser clogged and the carpet is a mess. The pool…ha ha….the pool (long story – next blog?). All of this “house” stuff that never stops. Like the extension cords that I stretched all over the house 7 years ago when Bob was in the ICU. Now I just find myself stretching . Things need to be done. Weeding, the garage refrigerator needs to be cleaned out, and that cluttered closet….. Same as before. Life goes on. You still have to do the dishes. I spoke with someone who was happy, fit, relaxed….and actually got a bit jealous. Almost cried. Same. The enemy is attacking me the same places as before. Lord help me to find what I’m supposed to out of this one. The enemy is the same…..and SO ARE YOU! Amen. You win God. You are my healer, deliverer, redeemer. You are my creative all-powerful God. You win. I trust you. Because in the past God HEALED BOB….PROSPERED OUR BUSINESS…GAVE OUR FAMILY VICTORY and PEACE. So this time, God will do the same. JC is the same Yesterday, Today and forever. I’ll take more of the same. I just need to see it clearly, through the eyes of my creator. My mom always says “whatever doesn’t kill you makes you stronger”. I know that this fight is not killing me, but I sure don’t feel stronger. I feel weaker. The bible says that HIS strength is made perfect in our weakness. I feel weak…so His strength must be being made perfect. I rest only in knowing that HE is strong, and that His strength is what is holding me up. This fight is pushing me back into Him, into His strength. I feel so weak, so small. Thank you God that you are so big, and that You’ve called me back into this place. I won’t run away from you, I will be vulnerable to You. I can’t hide from what is happening…but I can hide in You. Under the shadow of Your wings I will find rest, I will find strength to go on. Those who wait upon the Lord will renew their strength. I will wait. Maybe not so patiently or gracefully…but I will wait. I will wait on God to move, again. He will. Maybe I think a blog should be encouraging, or interesting…and all I can do when I sit here to write is question and complain. WHY? Why is cancer attacking Bob again? Why are we dealing with this fight again? Why am I so discouraged? Why am I feeling defeated? Why us? Why, why, why?!?!? No one wants to read this, no one wants to listen to complaining. Heck I don’t even want to listen to it myself. So instead of puking all over these pages I had decided to keep it all inside. Good choice? I think not. Soooo….let the questioning / complaining / puking all over these pages begin.